If you're looking for home inspection software that is fast, flexible and easy, Palm-Tech is the answer. Palm-Tech runs on the iPhone, iPad, Android phones and tablets, as well as Windows PCs. Make the most of your time on-site and produce awesome looking reports with no extra effort by using Palm-Tech Home Inspection Software. Join thousands of home inspectors around the globe who make the most of their time on-site. Inspect once, and let Palm-Tech create your report, your way - with no extra steps required! Speed matters as there is only so much time in a day. Palm-Tech gives you the tools to make creating your inspections fast. Do it all in the field or finish it up at the office. Its up to You! With Palm-Tech, you have control! You control the inspection points, all of the language and the way your home inspection report is presented and delivered. We've yet to talk to a home inspector who didn't value easy to use software. You won't find a software that is easier to learn and use. 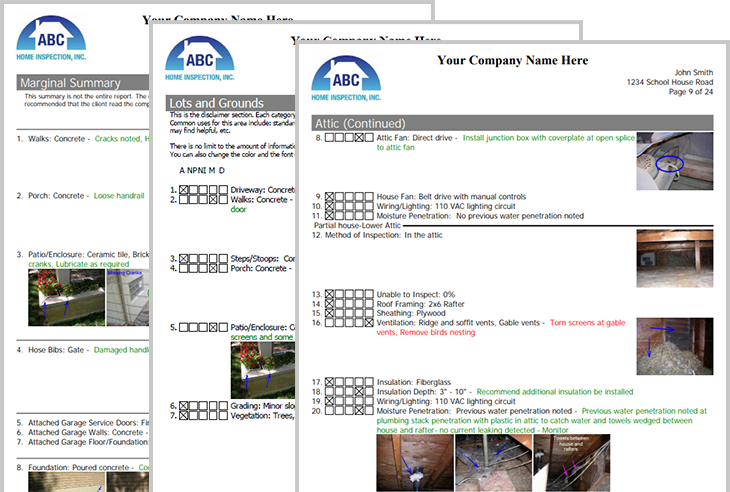 Create home inspection reports that your clients and agents will love! Your reports will be clean, simple and easy to understand. Call us during business hours and you get a live voice in the US ready to help. Call us today at 888-736-2462 and see for yourself. With Palm-Tech, the price you pay is the price you pay. Once you purchase the software it is yours to keep. There are no monthly, annual or per inspection fees! Palm-Tech creates home inspection reports that your clients and agents will love! You have all the flexibility you need to create reports that look exactly how you want. Take a look at some sample reports. With Palm-Tech, the price you pay is the price you pay. Once you purchase the software it is yours to use. There are no monthly, annual, cloud, support or per inspection fees! Ready to get started today? Place your order before 3pm EST on a normal business day and receive the software the same day! It’s very easy, very simple. It will change your life because it will give you time at home after your inspection… We love it. The reason we went with Palm-Tech was because of the ability to customize it.... We’ve been very happy with it. Been using Palm-Tech for about 5 years….It’s very nice and easy for my clients to differentiate and read the report. Palm-Tech gives you a ton of great online resources that make learning the software fast and easy. Check out our video tutorials, step by step HOW TO documents, or attend one of our free training webinars. Palm-Tech Home Inspection Software gives you everything you need to easily create professional home inspection reports for your clients. You'll be able to get started fast and take advantage of the flexibility it offers to make your reports look the way you want.